An unbroken chain-of-custody is necessary to protect an organization from the downstream risks associated with ITAD. Chain-of-custody is not a catchphrase: It is the foundation for indemnification and transfer of liability. Asset tracking requires verifying the custody of each asset. Only a careful, objective examination of tracking data can confirm chain-of-custody. Unimpeachable chain-of-custody evidence is essential for compliance and risk management. Chain-of-custody is critical to hold employees and vendors alike accountable. “Certificates” of disposal are meaningless without verified chain-of-custody. Unfortunately, the task of inventory reconciling typically goes unobserved and unappreciated. The science of chain-of-custody reconciliation is usually only appreciated when disaster strikes. Reconciliation is the process of linking records. The simplest kind of record linkage generates links based on individual identifiers that match among data sets. Academics refer to this process as deterministic or rules-based record linkage. Asset managers often call it serial number matching. Two records are said to match via a deterministic record linkage procedure if all or some identifiers are identical. Deterministic record linkage is a good option when the entities in the data sets are identified by a common identifier (e.g. 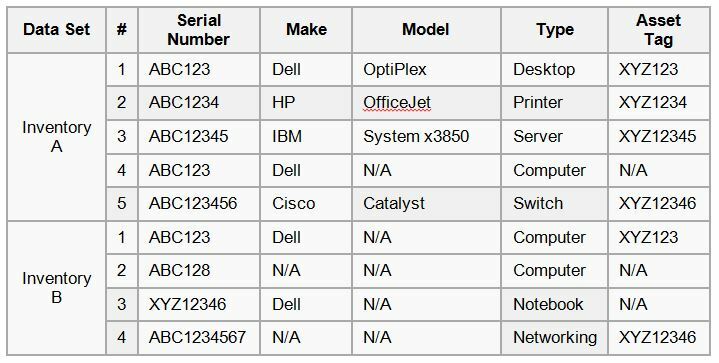 serial number), or when there are several representative identifiers (e.g., make, model, type, etc.) whose quality of data is relatively high. As an example, consider two standardized data sets, Inventory A and Inventory B, that contain different bits of information about IT assets. 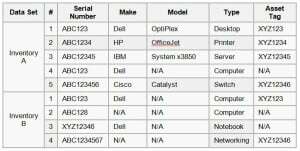 The most simple deterministic record linkage strategy would be to pick a single identifier that is assumed to be uniquely identifying and declare that records sharing the same value identify the exact same IT asset. In this example, deterministic linkage based on “Serial Number” would create an entity based on A1/B1. However, because A1 and A4 also share the same identifier (i.e. they appear to be a duplicate record), deterministic linkage based on the serial number would create another entity based on A4/B1. Effective handling duplicates, as well as exceptions (such as missing identifiers), involves the creation of additional record linkage rules. Probabilistic record linkage (also called “fuzzy matching”), is required to link records that do not share an identical value for an identifier. Fuzzy matching is, by its nature, subjective, making it less reliable and almost impossible for an 3rd party to validate. In this example, the manufacturer serial number for A5 and B4 are very similar, but not identical. Should they be considered a match? Secondary identifies and specific rules can minimize the subjectivity of fuzzy matching. In this example, A5 and B4 share the same value for “Asset Tag.” By leveraging a “two-key tracking” process (i.e. serial number and/or asset tag), Retire-IT dramatically increases the probability of success with deterministic record linkage. As this very simple example demonstrates, even a small decrease in data quality or small increase in the complexity of the data can result in a very large increase in the number of rules necessary to link records properly. Eventually, these linkage rules will become too numerous and interrelated to build without the aid of specialized software tools. Retire-IT pioneered the use of disposal tags and created two-key tracking software to automate the process of rules-based reconciliation. If there is anything I can do to be of service to you, please just say the word. Sign-up to save now. Decide later. Don’t miss your chance to save.